Sometimes, you come across a fragrance that just isn’t to your taste. Miss Dior Cherie is not to my taste. While I do tend toward the fruity and the sweet, Miss Dior Cherie is like a candy strawberry syrup attack that goes straight up my nose and into my head. Congratulations are in order, I suppose. No. 5, Shalimar, Brut, and all the powerhouses of the 80s combined could not induce a perfume headache. Today, Miss Dior Cherie took that prize home. In Bottle: Sweet, sweet, synthetic strawberry layered over a lovely slather of caramel. There’s so much sweetness and sugary fruitiness in this that it’s crossed the line between edible, wearable sweet and cloying sweet. I tend to think of myself as having a high tolerance to sweetness. After all, I didn’t mind the tooth numbing sweetness in Love of Pink by Lacoste or Pink Sugar by Aquolina. But that combination of sugar, candy and strawberry in Miss Dior Cherie takes it a notch above just sweet into shrill sweet. So sweet you can feel your blood turn to high-fructose corn syrup. Applied: Initial minor burst of sweet citrus aside, Miss Dior Cherie wastes no time letting you know what she’s up to. She’s going to turn you into a walking strawberry lollipop. I immediately got hit with the sugar and caramel and whatever else is sweetening this so much. It’s cloying upon first application and several hours later, it’s still cloying and I can still smell it. It being the initial notes upon application. I was really surprised to find this fragrance hadn’t moved or evolved on me at all. If nothing else, Miss Dior Cherie deserves applause for longevity. The strawberry candy fragrance is a strong one. The projection isn’t bad. It’s neither far nor short. It’s just right. I just don’t think this one works for me. And as I wait a few more hours, it starts to turn for the cleaner, melting down from strawberry lollipop to jaded strawberry and sweet, fresh florals. I can only assume that slight and freshness is the patchouli trying its hardest to come up. The dry down is rather pleasant, though surviving that powerful longevity to get to the clean last act is too much of a challenge. Really, the initial burst and the workings of those middle notes just reminds me of cough syrup. Sorry, Miss Dior Cherie. Extra: Dior’s had a lot of hits in the past. The original Miss Dior, Diorella, Poison. All of them to be respected. And a lot of people really love Miss Dior Cherie. I can see why. It’s a very sweet, very fun, extremely girly fragrance. But to me, it overdid the sweetness and the strawberry note was too candy-like. The fragrance itself didn’t dry down fast enough for my tastes and the dry down is really where I start to appreciate Miss Dior Cherie. Otherwise, she sits right at the start with that syrupy strawberry and remains one-dimensional for hours. Overall, Dior has had a lot of hits, a lot of great fragrances and Miss Dior Cherie, while popular and peppy and cute, is probably not one of my favorites. Design: Lovely and simple bottle glass bottle with a metal bow attached to further add to the youth of this fragrance. It is overall, very nice, youthful, and trendy packaging. The sprayer works fine, the packaging is adorable. And the French commercial is one of the most fun-loving, uplifting perfume commercials I’ve seen. A very recognizable, in branding, fragrance. Notes: Green tangerine, strawberry leaves, violet, pink jasmine, caramel popcorn, strawberry sorbet, patchouli, musk. I admit, I’m probably not the target group for this. It seems like Miss Dior Cherie was made for women around my age or younger but they kind of missed me I suppose. I wanted to love this fragrance. Really, I did. But I think I’d like a more understated fragrance. Nevertheless, Miss Dior Cherie would be a wonderful hit for a teenager or younger woman who absolutely loves sweet scents. 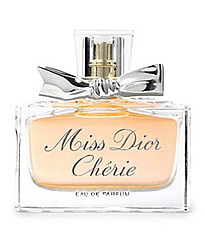 Reviewed in This Post: Miss Dior Cherie, 2010, Eau de Parfum. This entry was posted in dior, fruity, gourmand, Reviews By House, sweet and tagged cherie, dior, fragrance, lollipop, miss, perfume, review, strawberry, sweet, syrup. Bookmark the permalink.